Not pretty, but neat and masculine and makes for a wonderful memoir quilt! 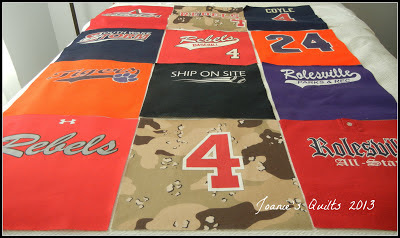 I am having so much fun making this baseball t-shirt for my grandson. It has been on my list to do for a long, long time. What joy I had as I was cutting up those t-shirts and stabilizing them with 906F Pellon interfacing. Each square is 14 1/4". Why such an odd size? The plan was for 15" blocks but since I am using t-shirts from Caleb's younger days I didn't have quite the width. Good thing I started with the oldest shirts first. Next I will begin to make frames and a shadow effect. I also need to make a few more blocks but ran out of 906F Pellon. This will be Caleb's. Caleb is a tremendous baseball player as well as an excellent student. He was invited to play in the Cooperstown Little Majors Youth Baseball Hall of Fame. He plays in a traveling baseball team as well as for his High School team. It keeps him out of trouble since he is always playing baseball and he loves it! He breathes baseball! 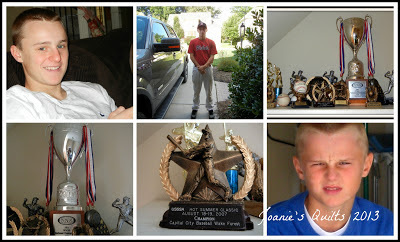 He is my middle grandson, now 15 years old and has his driver's and learners permit. Not possible! Okay it is just don't want to admit to it! I thought it would be nice for you to see who the quilt will be going to. The collage does not begin to show all his plaques and medals received. So I have gone on with the honors but the greatest thing about this kid is his compassion and kindness toward others. He always strives to be good. So back to the quilt. This is a WIP that I want to share in the linky party WIP Wednesday at Freshly Pieced. Quiltsy also provides a linkup. So if you have come across my blog please share if you ever made a t-shirt quilt or had a desire to make one. If you have made one please tell me how you quilted your t-shirt quilt and what kind of quilting design you used. If you happened to use polyester (nylon like) t-shirts I would love to know your experience with machine quilting it. Thanks so much! I appreciate every comment and will respond to each. Happy Quilting, Sewing and Linky Party Visiting. I have made 3 tshirt quilts. I channel quilted them all with vertical straight lines. i figure it is about the tshirt designs not the quilting. They have all been washed a ton and have stayed nice- even my husbands, which included threadbare boy scout camp tshirts from the 70s. Maggie I love hearing how the t-shirt quilts you have made are treasured! Heart-warming to know all the efforts are appreciated. Thanks for visiting. I have started collecting my husbands geeky t-shirts so that I can eventually make one of these quilts. I have only ever used 100% cotton quilting fabrics, so am nervous about stretchy t-shirts. Any advice? Hello Cath, I have been stabilizing the polyester fabrics with a sheer weight non-woven Pellon which so far is working out well. This is my first attempt so I will give advice when I have finished. I'm used to working with 100% cotton. Though I did make two silk tie and faux suede quilts that came out great! I stopped by your blog and didn't see a way to contact you so I hope we cross paths again. Joanie's- How did the polyester fabric work? My son has a few he wants me to throw in, and I want to be sure they will work. I just finished quilting and it came out great! Stabilizing is the key! Welcome to my place . . .
where I share my passion for quilting! It all began when I participatied in a block challenge in 2004. Now almost 12 years later I still am making quilts. Needle and thread have long been in my hand since a teenager, beginning with knitting needles and making clothes with the sewing machine. Something Spring on a Cold Wintery Day . .
the quilt by clicking on the picture. It is Finished!! Oh Happy Day! !